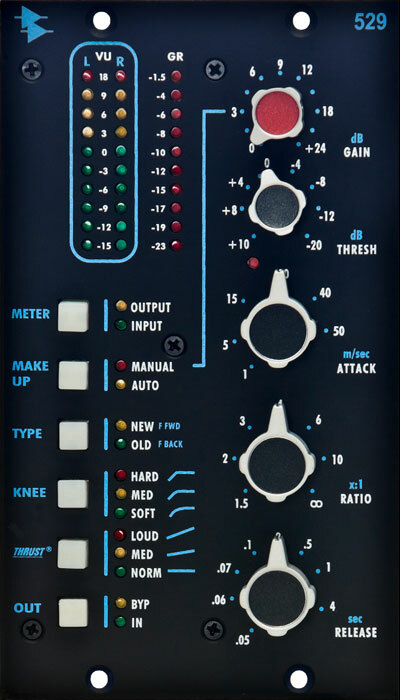 The new 529 Stereo Compressor combines the unmistakable sound of API's compression technology with the convenience and popularity of the API 500 Series format. Carefully designed to deliver a wide range of compression options, the 529 delivers warmth, clarity and punch, whether used for subtle adjustments or heavy compression effects. Based on the unprecedented success of the 2500, the 529 takes many of the features and controls from API's famous stereo compressor and puts them into the first dual slot 500 series module from API. This stereo compressor features API's patented THRUST® circuitry for a punchy low end, along with an Old/New switch that lets you choose between classic and modern compression characteristics: Old for vintage-style feedback compression and New for today's more common feed-forward compression. The Auto-makeup Gain button lets you adjust ratio and threshold controls without affecting the output level. Using API's discrete op-amps and transformer technology, the 529 delivers the legendary analog sound of API. The 529 is backed by API's unique 5 year warranty.